This spring a pair of flickers began simultaneously excavating wood chips from an old nestbox behind the crib and also excavating a new cavity in one of the large sycamores in our front yard. This happens frequently - it seems the male and female don't agree early on about where the nest will be. Or, maybe it is just an insurance policy. For such a seemingly wasteful practice to evolve, there must be a substantial benefit. As the male flicker worked indefatigably on the cavity in the sycamore, often 5 or 6 starlings would perch on a nearby dead branch, within 3 feet of the flicker, just staring at him. They obviously knew the cavity was too small and that it would soon be large enough for a starling nest. Often when the flicker would leave to feed, a starling would perch on the hole and peer inside. From past experience, it was apparent that there was no way the flickers would successfully nest in the sycamore cavity. Previous owners had on several occasions chopped the heads off these old trees. Total crown removal causes many upward facing cavities, which only starlings are foolish enough to use for nest sites. After a heavy rain, nestlings often drown in such cavities. But, the sycamores still harbor a small hoard of starlings. I remove all nests that I can reach from a 20' ladder, but new nests are soon started. It's much like pulling poison ivy - you have to do it, but you will never win. 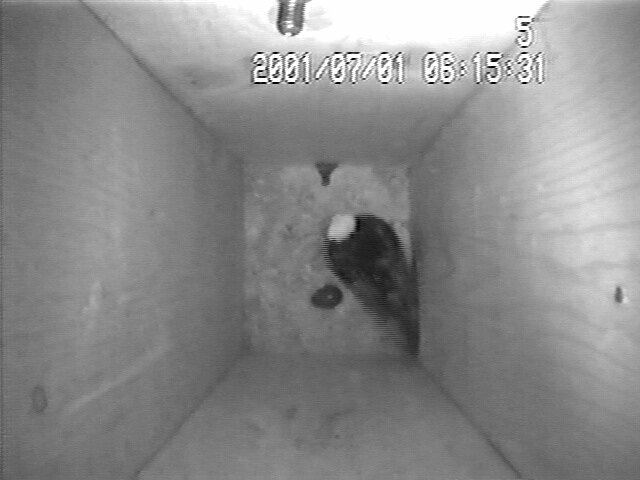 The old flicker box behind the crib proved to be more promising. 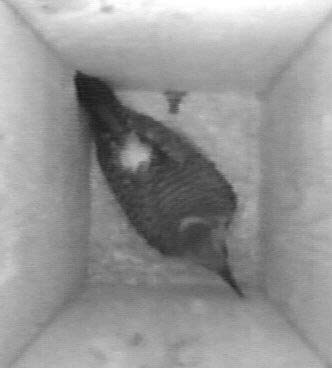 Both the male and female flicker were observed removing wood chips. A starling moved in at one point and was trapped. 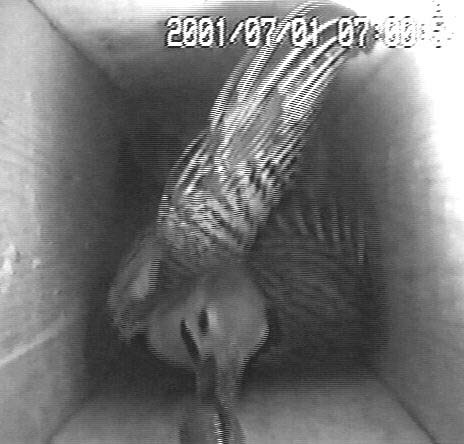 The flickers never did begin nesting in this box. As of 6/30/2001 it remains unused. The flickers seemed to be biding their time, trying to outwait the starlings before beginning to nest. And, actually, starling nesting activity seemed to cease in mid-June, when the flickers moved into a new flicker video box in the barnyard. They had showed no interest in this new box when they were excavating the other two sites. In the meantime, I trapped 14 starlings in the video box. 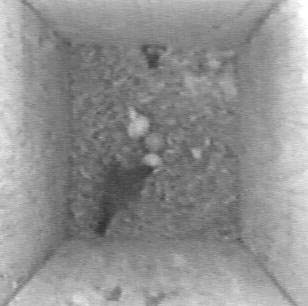 Now that starlings seemed to be disinterested in claiming cavities, the flickers began nesting in the video box. I began taping the incubation on June 27. 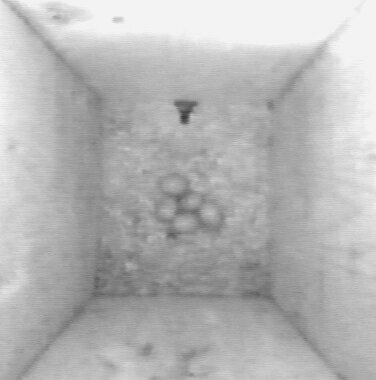 The male incubated all night and both adults seemed quite attentive, probably never leaving the box unguarded. 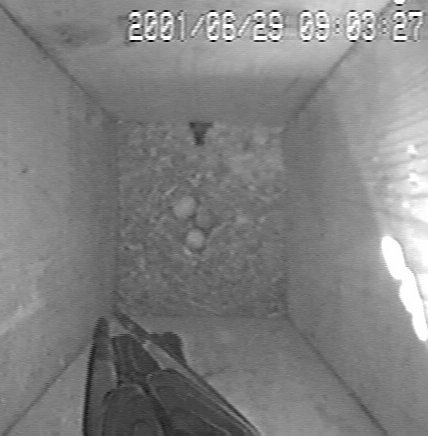 Between incubation bouts, an adult would usually perch in the entrance, rather than leave the nestbox. Everything seemed to be going well until the morning of June 29, when I discovered two eggs missing. Videotape hadn't been running that night, so what happened was not recorded. 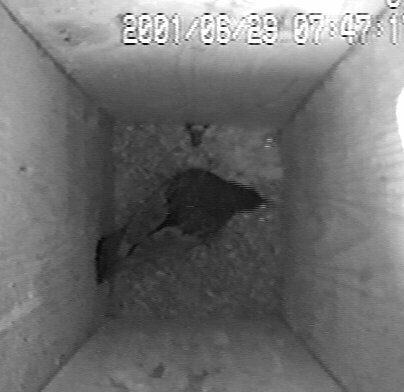 However, the first visitor to the box that morning was a starling. It simply dropped to the bottom, examined the eggs, and left. Next, a house wren dropped in for a few seconds, pecked an egg and left. Then the male flicker returned, began to incubate for about 1 minute, then left, to never return that day. 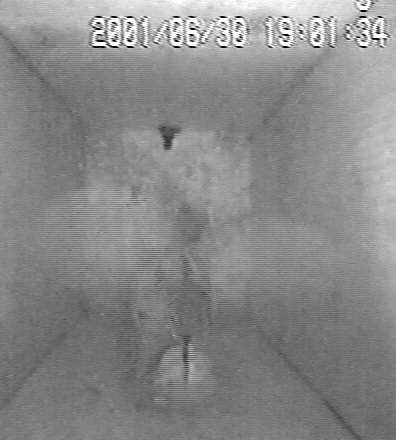 Note: Please learn from my mistakes - If you bother to set up a video nestbox, run tape around the clock to catch such events. The tape can be reused as soon as the next day if nothing has happened. 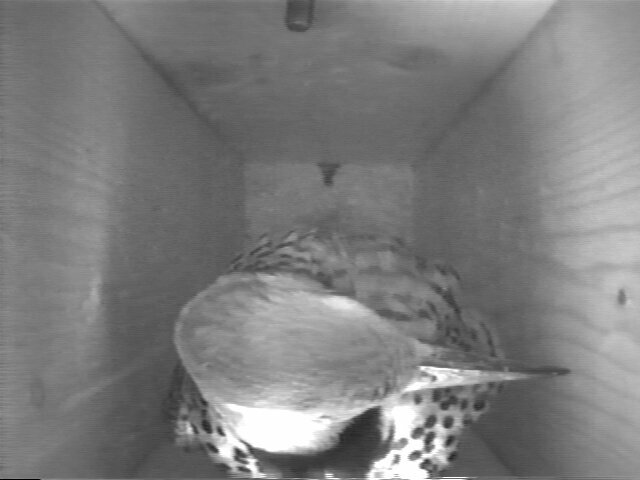 Our yellow shafted flickers have, for years, faced severe nestsite competition from European starlings. Location of the nestbox seems not to be a factor - starlings usurp flicker cavities 60 ft up in the hickory snags in the most remote area of our property as well as in boxes mounted on 4' posts in our yard. 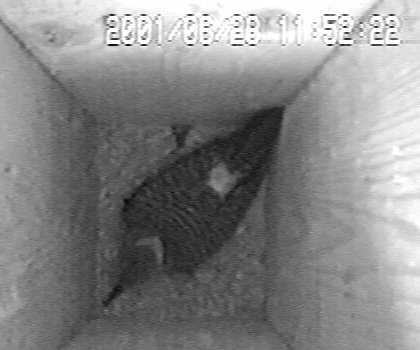 Continual monitoring of nestboxes and removal of starling nests helps, but is no guarantee that the flickers will be allowed to nest. 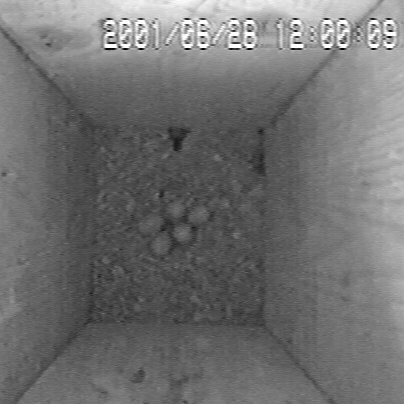 7/1/2001 Update: Yesterday I placed two infertile wren eggs in the flicker box and recorded both a starling and a house wren carrying the eggs away. 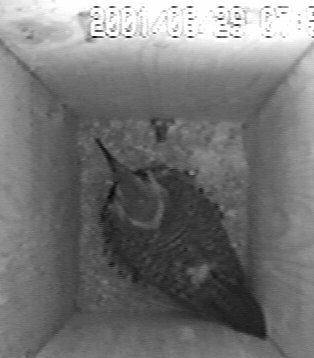 Last night I placed 4 infertile wren eggs and a large glass egg in the flicker box and ran continuous videotape. The glass egg was approximately the size of the flicker eggs, but much heavier. Shortly after 6am this morning a starling began making quick trips to the nest to haul away the wren eggs. After all the wren eggs were removed, the starling made several more brief visits to the nest to peck at the glass egg and try to pick it up. At 7am the male flicker returned to the nest for the first time in 24 hours and promptly picked up and flew off with the glass egg, never to return for the remainder of today. This sounds like an attempt at well justified revenge. I never did find Diane's decorative glass egg. It's good she is understanding about such things. Since I can see this box from my workshop window, tomorrow I will set a string trap and try to catch the starling. &COPY; 2001, 2013, American Artifacts and Richard Van Vleck, Taneytown, Maryland.